Greek crisis: Why should people outside Greece care? 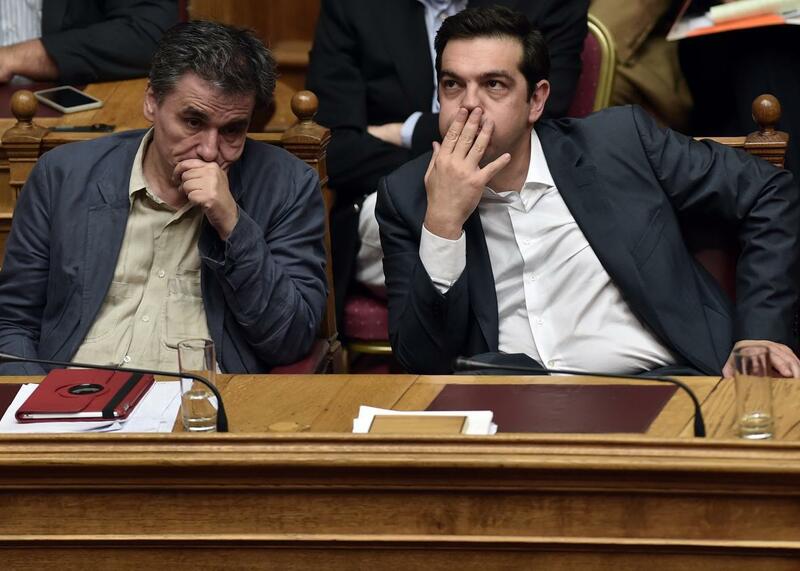 Greek Prime Minister Alexis Tsipras, right, and Finance Minister Euclid Tsakalotos react during a parliament session in Athens on July 15, 2015. Do you want serious reasons or fun reasons? I will provide both. Apart from the enormous humanitarian impact, the Greek crisis is important far beyond Greece because the future of European democracy and the euro is being written there. The crisis is forcing us to consider important questions that have been cheerfully ignored until now. Will the euro remain, dissolve, or break into parts? This will have drastic impact on the world economy. What do we want the European Union to look like? Should it become a federation? Or is it already too tight and needs to become a looser association of countries again? Break up even? Or downsize? How many countries? One-track, two-track, or multi-track? How much power should the EU hold? It is currently claiming the power to dictate Greek laws (indeed a greater set of reforms than Thatcher did to Britain) and to be consulted even before the Greek people are informed of any new law ideas. This is because Greece is bankrupt and relying on EU refinancing for its debt, but the open discussions about a European finance officer or similar ideas suggest that the EU may soon claim the power to approve or reject fiscally relevant laws in all member countries. Where is the representation of the people? Right now, the EU cannot be called democratic, the eurozone even less so. And even if those were democratic, there is the matter that the EU mixes legislative and executive, giving unprecedented power to European governments to implement laws against the will of the national parliament by passing them via the EU. Not a possibility, a reality. Think I’m exaggerating and this is really just about debt? Read my explanation here. The answers to these questions will not just massively affect Greece, but also the U.K., which will soon vote on staying/leaving the EU, as well as many countries that now have populist anti-EU movements. I myself was massively disillusioned as to the nature and functioning of the European idea through the events of the Greek crisis. 1. A set of uncorrupted rebels taking on the establishment in 19 countries at once. One of them is even regularly called a Che Guevara, or, as the New Yorker preferred to title its overlong portrait piece, “The Greek Warrior.” Yanis Varoufakis commands the media and can make international headlines just by wearing a shirt. (Supposedly not wearing one would also work; he has a lot of female fans.) When he stopped giving interviews for a few days, the normally ultraserious German newspaper Frankfurter Allgemeine Zeitung ran a front-page article about the fact that he hadn’t given any interviews. He also already appeared in four videos in the past eight months. No other professor or politician is portrayed as often in the role of the underdog fighting the global establishment. 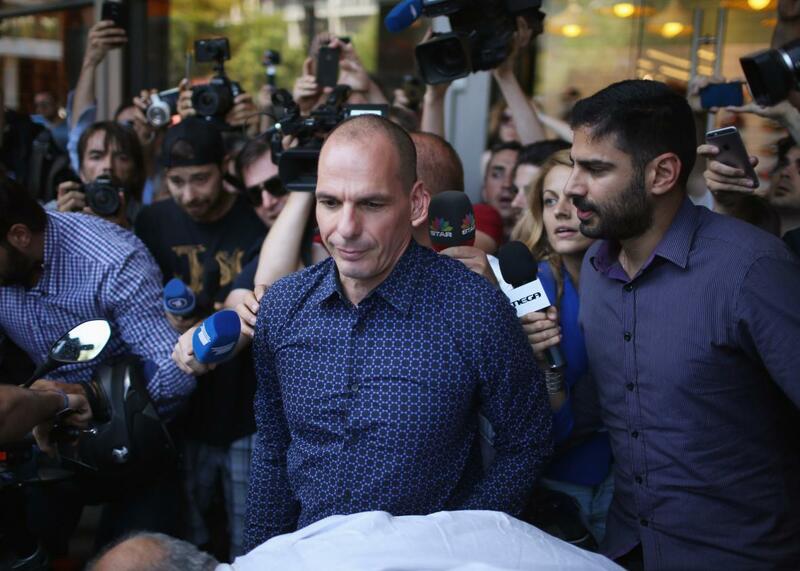 Former Greek Finance Minister Yanis Varoufakis faces a barage of media questions as he leaves the finance ministry after resigning on July 6, 2015, in Athens, Greece. 2. Extremely high stakes. The future of the European Union and all that. (See above in the nonfun part.) As a result, a conservative estimate of the number of people watching this “battle” is 300 million. 3. Clear choices: Yes or no, in or out, euro or drachma, Schäuble or Tsipras, cool Berlin or sunny beaches—everyone can have an opinion. If none of the previous words evoked any gut reaction, throw a coin and join the melee. 4. Regular showdowns with predictions of Armageddon. Preannounced, so you know when to tune in. And they are never resolved until the very last minute, or in overtime. 5. More plot twists than any sitcom. The prime minister who arrived to tear down all memorandums (bailout treaties), then finds himself in the middle of negotiating a new one, almost signs, instead gets up and calls for a referendum, lobbies for a no, gets a huge majority for no, everyone thinks he’s going to introduce the drachma, but a few days later he pretends to have heard yes and negotiates the harshest memorandum of them all, which he however attacks at every opportunity while implementing it, until the day he resigns, when he suddenly calls it a good job—and asks to be reinstated. Seriously, you can’t make this up. And the side plots—Tsipras’ “love the sinner, hate the sin” comrades, the angry authoritarian female speaker of Parliament, and the threat of imploding conservative parties from Berlin to Helsinki. The entertainment value is high even when Tsipras is playing at being a reliable head of government. I really admire the spirit of the Greek people, who have suffered so much. Grexit Crisis: How can the Greek crisis be fixed? Economic and Political Turmoil in Greece : In layman’s terms, what is the Greek debt crisis? Grexit Crisis: What exactly happened to the Greek economy?